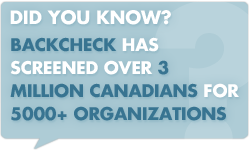 BackCheck provides a global pre-employment screening solution with multilingual support and 24-hour a day service. We offer a full suite of services to satisfy background checks and due diligence requirements for candidates abroad. We deliver consistent results, ensuring our clients’ global screening needs are met. Criminal Record Checks are available for over 200 countries and territories and are retrieved from either local government agencies, police, or the most reliable source in-country. Providers are strictly vetted and audited regularly to ensure our Criminal Record Checks are in full compliance with all applicable legislation including the European Directive on Data Protection and the United States Safe Harbor Principles. Our experience and leading technology allow us to design comprehensive global pre-employment screening programs ensuring consistency of screening across entire client organizations. BackCheck maintains a proprietary database that validates identity documents such as passports and national identification cards. Meets the standards of the United Kingdom Right to Work Verification Mandate. Contact BackCheck for detailed information about our Global Capacity. Are you based in the UK? Visit www.backcheck.co.uk.